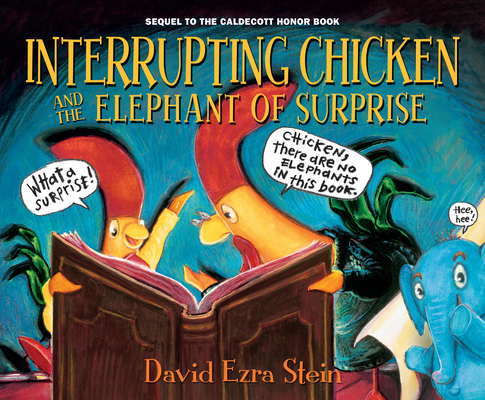 David Ezra Stein is the author-illustrator of many picture books, including Interrupting Chicken, which was awarded a Caldecott Honor, I’m My Own Dog, Ice Boy, and Dinosaur Kisses. He lives with his family in Kew Gardens, New York. Stein’s art is rich, textured and varied. Like ‘King Alice,’ this book features stories within stores. All with elephants. Lots and lots of elephants, each of them, as advertised, surprising. Stein contrasts the richly colored, comfortable scenes at home with the pale, restrained traditional storybook illustrations, which are in turn jolted by the addition of the colorful, comical Elephant of Surprise and Chicken herself. Following the same basic structure as the original story, this sequel is fresh, funny, and satisfying in its own way. A treat for Interrupting Chicken fans. Stein masterfully builds suspense with each imbedded story, for a gag that only gets more fun with each reveal. The prose matches the vibrancy of the illustrations with humorous dialogue between Chicken and her patient Papa. Multiple award-winning author and illustrator Stein has created a noteworthy title for library shelves in addition to his already beloved collection of picture books. A terrific choice for one-on-one and small group sharing. Stein’s mixed-media illustrations allow the narrative styles to bounce back and forth between silly and serious, showing both wacky and cozy moments and honoring the warm, loving relationship between Chicken and her caregiver. Like its Caldecott Honor–winning predecessor Interrupting Chicken, this story centers on one extended gag; but many will enjoy giggling at it again and again, likely with a grownup of their own. Little Chicken is back, and her metafictive editorial impulses are as strong as ever...fans of the two loving characters will be delighted to see them again. Unsurprisingly good. The father’s amused exasperation [in Interrupting Chicken and the Elephant of Surprise], the child’s delight, the wordplay and the exuberant artwork all combine to make this picture book at once a celebration of love and language and an entertainment that will stand up to many, many bedtime readings. Some jokes never get old.